What does a regular house cleaning service include? A: Our regular home cleaning includes cleaning of surfaces, floors, countertops, mirrors, furniture. It also includes a thorough disinfection of kitchen and bathroom. A:Our maids bring basic non-toxic green cleaning products to the appointments. We ask that you provide some paper products, basic cleaning rags and cleaning supplies (a toilet bowl brush, a mop and bucket, a broom and dustpan and a vacuum). Will I always get the same cleaning person cleaning the house? A: We will do our best to keep the same service person. Sometimes, however, we may need to substitute with another cleaning person. Is your green cleaning service expensive? A: No. Our goal is to provide a service that makes your home more welcoming and inviting, a service that do not compromises the quality of air in your home and is safe for kids and pets. By doing the cleaning we want to free your time to spend on your family or activities that are important to you. We want you to enjoy your surroundings, have peace of mind and relax. Do you do laundry, ironing, dishes, change bed linens, refrigerator cleaning, or other housekeeping services? A: We can customize your cleaning according to your needs. The pricing is derived accordingly. You need to let us know in advance what tasks you would like us to do and we will be happy to accommodate you. Can l I hire your cleaning person directly? A: If you would like to hire independently one of our cleaners, please send a written request or an email. If we approve your request, there is a $3000 referral fee before our worker can work independently for you. Our employees are our most valued asset. Should I tip my cleaning person? A: Although tipping is not required, is always greatly appreciated. Do you provide any free amenities? A: Yes, our service includes small luxuries - free botanical lavender potpourri sachet or mints left on your bed pillow (upon request). What if something gets broken during the service? A: We will leave the broken item with a note and then contact you to resolve the damage. A: We are insured and bonded and we fully guarantee our work. We believe in open communication and if a customer is not satisfied with the service, for any reason, we'll gladly re-clean the home or work closely to resolve any issues. Customer satisfaction is our utmost priority! How do you train your cleaning personnel? A:All of our cleaning personnel is trained and have experience in cleaning and working independently. We also provide additional training to ensure that our philosophy is followed. Do I need to be home during the cleaning appointment? A:It is your preference if you want to stay home. Majority of our customers are not home. If you choose not to be home, we need a mean of entry to your home. 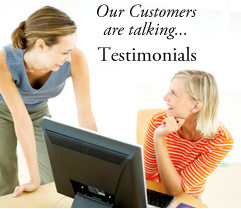 A: When you refer a new regular client to our service, you will receive 20% off your next cleaning. A: We require 24 hours notice. Cancellations within less than 24 hours incur 50% of the service charge. If our worker is unable to gain access to your home at the time of scheduled cleaning, you will be also be responsible for paying a lock out fee of 50% of your rate. In case of emergencies, we will not charge you. A: Our standard office hours are Monday through Friday 8:00 a.m. - 7:00 p.m. and Saturday 9:00 a.m. - 2:00 p.m.
A: Anytime you have any special requests, please do not hesitate to let us know. We always try to accommodate your special needs. We always welcome your comments and feedback and you can our office at (201) 694-1350 or send us an email at CustomerService@EcoGreenCleaningServices.com.